can be no progress. Without change, there is only stagnation,” (quoted from a post on the Market’s Facebook page). On Saturday, May 5, when the Ferguson Farmers’ Market opens its 2018 season, there will be a big change: you will not find the FFM at the Victorian Plaza. 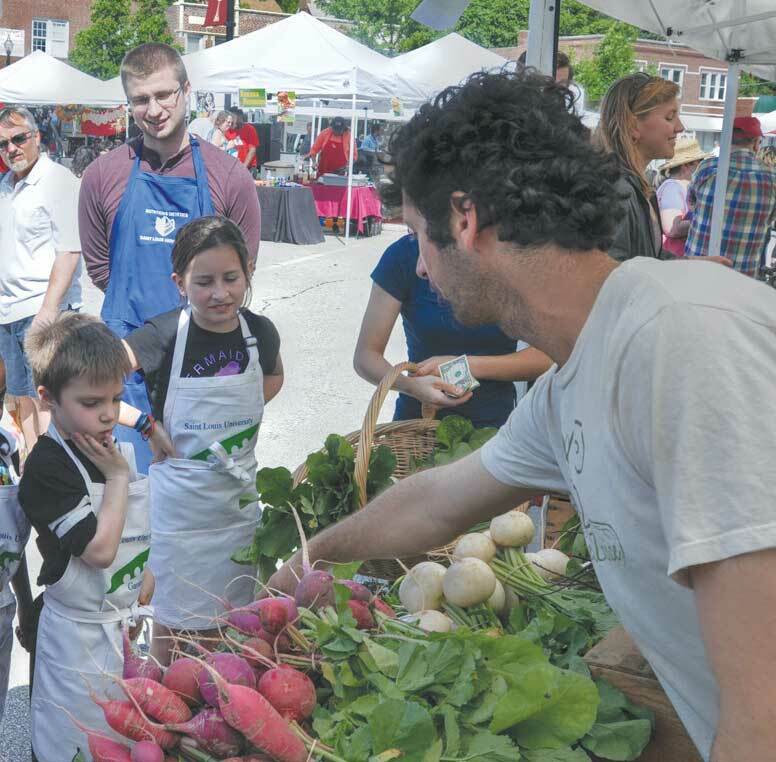 On May 5, the Ferguson Farmers’ Market (FFM) will open at Plaza 501. This is great news! And why would that be great news? Plaza 501 was originally built to house the farmers market (depending on who you ask). Businesses near Victorian Plaza need the parking spaces. There are 261 parking spots adjacent to Plaza 501: 39 in the back lot, 30 in the lot behind Ferguson Brewing Company, 27 next to Meineke, 30 at the Edward Jones lot, 67 in the Cork lot, 42 in Marley’s lot, and 26 in the Papa John’s lot. There will be four handicap parking spaces (as there were at Victorian Plaza). Crosswalks and lights will make approaching the FFM safer. So, what do the vendors think of this change? Baked Wood Fired Pizza Joint held their grand opening on Pi day, March 14. Located at 235 S. Florissant Road, the new pizzeria offers unique recipe pizzas, baked in a wood fired oven. The menu also includes appetizers, wings, salads. Gelato is on the dessert menu. Have you heard? The Ferguson Downtown Special Business District (FSBD) has received a grant from the Missouri Main Street Connection (MMSC). MMSC is dedicated to the development of a sustainable, volunteer-based organization that will carry out an economic development program based on the preservation of historic assets in the downtown commercial district. The Main Street America movement has helped revitalize historic downtown areas for more than thirty-five years. It is a project of the National Trust for Historic Preservation. The MMSC volunteer Board of Directors includes Main Street professionals, revitalization and preservation specialists, professors, attorneys, bankers, legislators and Missouri Department of Economic Development staff members. The MMSC has already served 178 Missouri Communities. During the next two years MMSC will provide FSBD with training and mentoring to establish a volunteer revitalization organization. This organization will in turn engage the entire community as a participant and beneficiary. The group also will attend regional revitalization workshops and conferences conducted by MMSC. This is great news for small businesses. The Main Street Connection process supports entrepreneurship and private investment in historic districts. Ferguson residents, business owners, and community leaders are invited to a meeting at Ferguson City Hall, Council Chambers, Thursday, May 3rd, 6-8pm. No registration is required. Missouri Main Street Representatives will present the Main Street 4-Point Approach® to Revitalization. Attendees will form groups based on these four points: organization, economic restructuring, design and promotion, and discuss what the community would like to see happen in each of the four areas. Typically, each group generates a large list; then prioritizes by casting votes for the most important, achievable activities to implement in the first year of work, putting other choices on the “back burner.” At the end of the evening, each group will report their top priorities. This information will then be used by the four corresponding committees to draft Action Plans for the CityWalk Board to consider. CityWalk business owners have a standing invitation to attend meetings of the Ferguson Special Business District Advisory Board, which meets the 2rd Thursday of the month from 5:30-7:30 p.m. FSBD meets at Mobile Eyecare Solutions, 248 S. Florissant Rd. For more information, please contact Robin Shively at 314-495-7452 or cornersframing@gmail.com. Welcome to Citizens Against Discrimination, located at 111 Church St., Suite 201. Kawana Waddell, owner of Style-Taneous Styles, plans to open a women’s boutique at 426 S. Florissant Rd. She anticipates a soft opening around March 16th and a Grand Opening on March 31st. Congratulations to Nehemiah Project’s Epicenter: they recently opened a second-hand boutique, Couturier for a Cause, at 104 S. Florissant Road. Proceeds from sales support the Nehemiah Project, and affordable housing agency that serves Ferguson and surrounding cities. With the downtown TIF (Tax Increment Financing) ending in 2023, there is a need to bridge the gap to continue work begun in the downtown Ferguson Special Business District (FSBD). The good news is that FSBD has received a Downtown Revitalization Grant from Missouri Main Street Connection, Inc., which assists revitalization programs in Missouri’s historic commercial districts. You’ll be hearing a lot about this initiative in the future. For a moment, let’s look at some of the recent history of the FSBD,with the assistance of Steve Wegert, former mayor and current president of Sportsprint, 6197 Bermuda Road. The downtown area was marketed by the Ferguson Station Business Association (FSBA). In the early 2000s, the FSBA hired Shannon Howard and began to rebrand, moving away from the long-recognized train theme. The business owners wanted to develop a more up-to-date image. Thus, CityWalk emerged. During this time, the organization began expanding its trademark events, such as Northern Lights and Street Fest. Prior to this, the FSBA survived on self-taxing revenue from the business licenses issued in the district. They raised approximately $35,000 annually with which they could carry out special projects, sometimes with the help of loans from the city. An example is the Victorian street lights you see in downtown Ferguson. In the late 1990’s and early 2000’s there was a big push in marketing Ferguson as “the place to be.” This led to the establishment of a TIF district to fund projects which would enhance the downtown district. Steve Wegert named many, many business owners and entities who were instrumental in this phase of downtown Ferguson’s development and feared leaving anyone out. However, most significant were Joe Lonero and Farzad Faramarzi. Farzad relocated his popular Thyme Table restaurant on the strip renovating a vacant Hardees and opened the Savoy banquet center in the old Savoy theatre. When Joe Lonero was unable to persuade Starbucks or Panera to locate in the downtown area, he established the Corner Coffee House (sadly, now closed). Vincenzo’s restaurant, the purchase and complete renovation of the old Sportsprint building to include lofts and retail space, the Brewhouse and Streetcar Lofts all followed. Many of those projects would not have been possible without funding from the TIF. CityWalk continued to add to projects to make downtown Ferguson a destination for persons outside of Ferguson. The Farmers Market developed into a CityWalk project. Later, concert nights were added. Much work remains, because revitalization is a work in progress. The world changes and business districts must evolve as well to attract customers. More next month on the Main Street Grant. Happy birthday to Faraci Pizza.. The Ferguson original is celebrating fifty years: happy golden anniversary! The much anticipated “Baked Wood-Fired Pizzeria” has already been mentioned in Sauce Magazine. The new restaurant plans to be up and running by the end of February. Employment applications are now being accepted. In 1973 a small group of neighbors and friends, who had seen houses in their community deteriorate, banded together to dedicate one day to elderly, disabled and low-income homeowners who needed help to maintain their homes. A movement was born, Rebuilding Together, and eventually blossomed into a national organization. Rebuilding Together – St. Louis joined the effort in 1992. More than fifty neighborhoods from around the St. Louis region have benefited from Rebuilding Together. Rebuilding Together has provided free home repairs for many years in Ferguson. The next project is scheduled for May 5, 2018. Emerson will supply funds and volunteers, as they have in prior years. This is a project that benefits all of Ferguson, including Ferguson CityWalk. Improvement of homes adjacent to CityWalk businesses can only improve business by setting a tone that is hospitable, and strengthening pride in the neighborhood. Rebuilding Together is looking for 10-12 homeowners on one block that meet their low-income requirements and that need home repairs, so they can participate in the May 5 Rebuild Together project. Ideally, they would have applications in hand before the end of February, in order to complete their evaluation process by deadline. For an application follow this link: http://www.rebuildingtogether-stl.org/wwwroot/docs/New2014_Homeowner_Application.pdf . To get further details on the organization and contact information, go to http://www.rebuildingtogether-stl.org/discover#vision or contact Dave Ervin, at (314) 918–9918, or dervin@rebuildingtogether-stl.org . CityWalk business owners have a standing invitation to attend the Ferguson CityWalk Advisory Board. The FSBD meets the 2rd Thursday of the month from 5:30-7:30 p.m. The meeting location for February has not yet been determined. To get this information, please contact Robin Shively at 314-495-7452 or cornersframing@gmail.com. Two Ferguson businesses emphasize the values of reusing, recycling and repurposing in two different ways. There are blessings to be discovered at Blessings Closet Thrift Boutique, 307 S. Florissant Road which opened October 2015. The Boutique provides fashionable, low-cost apparel options for the everyday individual. Blessings Closet is a 501(c) 3 organization with a non-profit program called “DRESS LIKE YOU’RE BLESSED.” The mission is to help persons with limited resources to assemble an outfit for job interviews, as well as for their first days on the job. Nikki Wilson, owner, remarks: “Some people don’t realize how awesome you can look for around ten dollars. I believe that everyone should be able to obtain simple things like clothing and still be stylish.” Nikki’s hope is “that people will open their closet and think of how they can be a blessing to others with what they already have that they no longer wear or can’t fit.” Blessings Closet is currently accepting monetary and clothing donations. For more information, you can email blesssingscloset@gmail.com or call 314-877-9888. Treasures are to be uncovered at Hidden Treasures, 220B N. Florissant Road, also a new and used boutique, of a different flavor. Hidden Treasures began its sixth year of business this November 2017. The business evolved before the store front opened. Owner Jeniece Andrews began in a small way, with one to two yard sales a year. After her husband was laid off, she started vending at flea markets. The next thing she knew she was buying jewelry, buying gold. Jeniece also began doing estate sales. Hidden Treasures prices are affordable, although this is not intended as a thrift boutique. Visit the shop and you will see clothes, jewelry, furniture, antiques and objects d’art. Are you mad about shoes? Well, here you will find shoes upon shoes: really stylish and in mint condition. Ninety per cent of clothing in stock is new, not used. If it is used, it has been used gently. Do you like vintage clothing? Upscale resale? Come and explore. Need help with an estate sale? Call Jeniece at 314-757-2858 or email her at jenieceandrews@gmail.com. Hidden Treasures best kept secret is that they are here! They are not so hidden: the store is right next to Little Caesar’s. Welcome New Businesses: People’s Healthcare Services located at 49 N Florissant Road inside Schnuck’s has joined the Ferguson CityWalk roster of businesses. At one of the Ferguson CityWalk gatherings, I asked Mike Palmer: “So who is this Montrey?” In my mind this was the owner of the cigar lounge located at 401 S. Florissant Avenue. Mike explained that the name “Montrey’s” was selected because the one hundred year old house in which the business is situated. Built by Joseph Montrey of Ferguson, he and his wife raised a large family in this home, and owned Montrey’s Bar less than a block away at 500 S Florissant (now Marleys). Mike Palmer was marketing the property for a lease. Someone approached him interested in converting the space into a private cigar club. The interested party did not pursue the idea, but after researching similar places within the St Louis area as well as the cigar market, he and his business partner found this would provide a unique destination and the vision for the Ferguson Special Business District. Montrey’s offers a selection of roughly one hundred varieties of cigars at any given time, and the selection changes every month or so. They also have one of the best spirit collections around: whiskeys, bourbons, scotches and cognacs offered at different price levels. In addition, there is live music on Friday and Saturday nights. Montrey’s has a private members’ lounge: a few remaining memberships are currently available. Cutting edge air filtration system inside keeps the smoke from becoming overwhelming. There is a large patio in the front and back of building. Need gift ideas for a cigar aficionado? Mike offers a few suggestions: “We have cigars that can be sold by the box. We can order special cigars by the box: there are thousands of types of cigars, if someone has a favorite. We also have our very own branded ‘Montrey’s’ cigar in stock.” Furthermore, they have cigar accessories for sale on site such as butane lighters, cutters, punches, and torches. Or what about that membership opportunity? Don’t smoke, but like to do crafts? Montrey’s makes cigar boxes available for one dollar a piece. And while we are talking about smoke… Welcome back to Ferguson, Red’s One and Only BBQ! Red’s is smoking up a storm 304 S. Florissant Road. The grand opening was November 11. That’s the equation in my brain. But Ferguson’s Municipal Public Library has a much longer, much more complex equation: FMPL = Books + Safety +Education + Art + Employment Support + Outreach +Creative Response to Community Needs. An essential part of that equation is Scott Bonner, the Director of the Library. Yes, Scott has a Master’s in Library Science. He also worked in mental health. The combination of these work experiences helps to broaden the vision of “library” as more than a repository for print media. The library can be a source of many forms of help for citizens of Ferguson. Scott began his directorship on July 1st, 2014. He took the position because he fell in love with what he saw at the library, and then proceeded to fall in love with Ferguson. Six weeks later, he was part of the unfortunate history that has been played over and over in mainstream media across the globe. The civil unrest that erupted that August and again after the grand jury’s verdict in November of 2014 made for synergy, as Scott asked: “How can we help? What do people need? What more can we do?” The library staff followed his lead as the library began to morph into: an “ad hoc school on the fly,” an oasis of safety, a gallery for “Hands Up, Don’t Shoot!” – an exhibit by the Alliance of Black Art Galleries, a location from which the U.S. Small Business Association could give emergency assistance to ailing businesses, and an agent of social outreach in many other ways. Donations poured in that constituted 95% of the annual budget. The Ferguson Municipal Library was awarded the Gale/LJ Library of the Year Award for 2015 for Courage in Crisis. What are Scott Bonner’s dreams for the future? Now that the most severe time of crisis has waned, so have the big donations that were realized in 2014 and 2015. How can we make sure that financial support continues at an intensity that will allow the library to hire a reference librarian to support small businesses, and provide other means of business support? The library wants to expand its outreach to schools, businesses, neighborhoods – reaching into corners of Ferguson that may have great need but don’t have easy access to the location. With such a vision of outreach, the building at 35 No. Florissant Road, while remaining a destination, can grow as a base camp to empower the library in providing resources beyond its brick walls, to schools, to businesses to all Fergusonians, while serving as an example across the country as to what “library” can mean in the 21st century. Welcome to The Nehemiah Epicenter at 104 S. Florissant Road, which houses the Nehemiah Housing Agency and a business incubator to both support and attract new businesses–small, new, and major businesses that can additionally contribute to the growth and well-being of the future of Ferguson. And yes, where there is smoke, there is barbecue – Red’s is coming. Red’s One and Only will be opening at the corner of S. Florissant Road and Compton Street. The recent smoke and lines were just a preview during a special, temporary permit. Business seeds being planted: more businesses to be sprouting up soon. When you think about planning a trip beyond Earth, you likely envision that happening a long time from now in a galaxy far, far away. Surprise: you can experience that today, in Ferguson, at 205 Brotherton Lane. While you know the schools that exist within the Ferguson CityWalk boundaries: McCluer South-Berkely High School, Vogt Elementary School and Our Lady of Guadalupe Catholic School, you may not be aware of a completely different type of educational experience here in Ferguson: The Challenger Learning Center. The Ferguson location is not just the only Challenger Learning Center in St. Louis – it is the only such entity in Missouri. This is not only a wonderful opportunity for school kids. There are programs for the general public, birthday party packages, corporate programs and summer camps, to name a few opportunities that are available for interplanetary travel in your own backyard. The Challenger Learning Center-St. Louis opened in November of 2003. It is part of the Challenger Center for Space Science Education, an international not-for-profit education organization founded in April 1986 by the families of the astronauts tragically lost during the Challenger space shuttle mission. This location is part of a growing network of over forty Challenger Learning Centers located throughout the world. The Center serves groups throughout the greater St. Louis region. If you want to know more, contact the Challenger Learning Center at 314-524-3490 or check out the website at www.challengerstl.org. Meanwhile, we’re waiting with bated breath to welcome several new businesses to Ferguson CityWalk. However, it isn’t official until the paperwork is complete. Keep your eyes on Ferguson CityWalk for these developments! One of Ferguson’s gleaming jewels is the Ferguson Farmers Market. Every Saturday, from May through October, the Market is in operation from 8 a.m. – noon. A group of Fergusonians including Bud Seiter, Joe Lonero and Gunner Brown started the Market in 2002. The 501 Plaza was in fact built for the market. However, by the time 501 Plaza was completed the Ferguson Farmers Market had already outgrown it, and so it continues at Victorian Plaza. Now in its fifteenth year, the outdoor market boasts an average of forty-two tents. Some of the vendors have been there since the beginning. Marveena Miller, the current Market Manager, came on board later in the Market’s history. Marveena, who holds a Master of Science in Environmental Policy and Research, saw an ad in the Ferguson Times. She and her husband moved to Ferguson in 2011 because they liked what they saw here. This is Marveena’s fourth season working as the Market Manager. In addition to her involvement in the Market, Marveena also serves as the Marketing Coordinator for the Ferguson Special Business District (Ferguson CityWalk). Marveena sees her role as “maintaining the integrity of the market,” and she is pleased to assert that overall the Ferguson Farmers Market has stayed true to what it started out as. The market is blessed by 20-25 volunteers who show up every week. The early crew starts at 5:00 a.m. and sets up all the tents. They are followed by the 6:00 am. crew, most of whom stay until 1:00 p.m. to tear down the tents. There is a third group who arrive around 11:30 a.m. and finish the process of tearing down. The only compensation for these volunteers: the success of the Ferguson Farmers Market. This year the Market collaborated with EarthDance Farm and obtained a Farmers Market Promotional Grant from the USDA. The funds have allowed Earth Dance to help transport people to the market to see fresh produce offered, and then visit the farm to have a tour and to see how food is grown. November through April, the winter market is hosted by St. Stephen’s Episcopal Church, 33 North Clay in Ferguson, 9 a.m. – noon, on the third Saturday of each month. An average of ten vendors are present. The next big Ferguson event is StreetFest 2017. This year, the festival has moved to 501 Plaza. Bands will play every hour, 5:00 – 10:00 p.m. on Friday, September 22 and noon – 11 p.m. on Saturday, September 23. In addition to music, you won’t want to miss trademark events such as the Manly Man High Heel Keg Relay and the combat booted Girly Girl Wench Relay. Ferguson CityWalk has a good range of services in the area of looking your best. If you just want to purchase products, you can check in at Mimi Beauty Supply (55 N. Florissant) or Lee’s Beauty World, 110 S. Florissant Road. In the market for a mani or pedi? A number of the salons provide those services, but that’s the specialty of the house for VP Nails (59 N. Florissant Road). As for salons and barbers: we have two businesses celebrating twenty-five years of doing business here in Ferguson: Ferguson Style & Spa and Latecia’s Beauty and Barber Salon. Sherry Loesch owns Ferguson Style and Spa, at 811 S. Florissant Road. Besides being proud of twenty-five years in business, Sherry is very happy to say her clientele is very diverse: men and women, young and old, all ethnicities. Latecia’s is a family salon, with a beautician and barber. There are four stylists available. They are located at 1028 S. Florissant Road. Happy silver anniversary to Latecia’s! Exotic Trenz owner Cynthia Brown is justifiably proud of her building at 600 S. Florissant Road. Talk about an extreme makeover! She turned a gas station and Meineke’s into a beauty salon. She is also happy to say, Exotic Trenz is a family salon. Fierce Ultra Salon, located at 920 S. Florissant Road, is yet another family oriented salon. Owner Hope Breedlove promises an atmosphere of peace to patrons. Viva La Shear is located at 975 S. Florissant Road. You can spot the salon: it’s the one with the giant shears on the south side of the building. So, with all this expertise, I polled as many of the salon owners as I could about recommendations for hair care in summer. All are agreed: just like you hydrate to keep your body healthy in the summer heat, you need to keep the moisture in. If you are a swimmer, after you are out of the pool you need to wash your hair with a clarifying shampoo: sometimes these are labeled as swimmers’ shampoos. Chlorine tends to adhere to the hair shaft and regular shampoo won’t get it out. Keep oil, dust and pollen out by shampooing and conditioning at least once a week. This also helps keep the skin clear. Deep conditioning can revive hair. Last of all, when choosing hair styles, pick something that will last through all the heat and all the shampooing. Stay beautiful (and handsome), my friends.